When you think of cycling the Saanich Peninsula you may think of the Lockside Trail - a nice easy route. But - oh no - we hardy twelve cyclists wheeled along the hilly, picturesque oceanside route instead! Upon disembarking the ferry at Swartz Bay we turned onto Land's End Road and 10k later braked to a stop at the $1 ice-cream spot, which was the perfect treat on a hot sunny day. Lunch was at Prospect Lake Park where we dipped our toes in the water before our roller coaster ride up and down to the Galloping Goose trail leading us into Victoria. 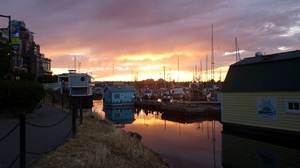 We had a comfortable stay in our large suites at the Admiral Inn, which was a ten minute stroll to Fisherman's Wharf, where we boarded our kayaks for a two hour sunset ecological paddle of the Inner Harbour. Our affable guides, Lucas and Thom of Kelp Reef Adventures were professional, funny and very informative. 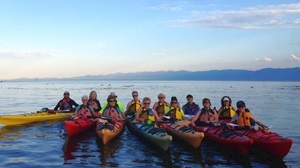 We slowly paddled past the colorful float homes at the Wharf then proceeded to race across the mouth of the Inlet (Paul and Cheryl outraced us all). In the morning, after our complimentary breakfast, we followed the yellow-signed Oceanside Bike Route along Dallas Road and the eastern edge of the Peninsula. Once again the weather was perfect to stop at the many viewpoints enroute. We enjoyed our lunch reclining on the grassy lawn at Mattick's Farm before continuing to the ferry. We thought it was a perfect way to spend two days at the end of June.